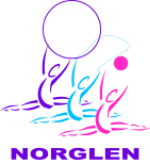 NorGlen Rhythmic Gymnastics is a non-profit organization that has been operating in Lakeview and the surrounding area of south Calgary since 1979. Our focus is on providing recreational rhythmic gymnastic classes to girls and boys aged three and up, and ladies. Emphasis is placed on improving flexibility and coordination and having fun. As a non-profit organization, we rely on parent help. We do not do any fund raising. The money you pay for classes goes towards the payment of gymnasium rentals, coaches, fees, badges, RGA membership fees, and use and insurance of club equipment. At NorGlen, all equipment is supplied.